Paul: The Games News comes at you live today from the Shut Up & Sit Down jacuzzi. We always thought it would be cool to have one, so we splashed out but didn’t actually think about where it would go or how we were going to install it. So now we’re just sat in an empty jacuzzi. In our swimming trunks. With no water and no bubbles. Still, there’s a new Uwe Rosenberg game coming, hooray! 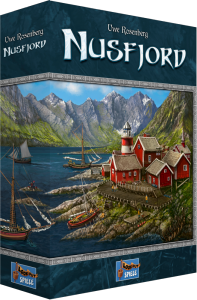 Let’s all hail Nusfjord, a game of fishing and worker placement. Quinns: Hooray! That said, we made this our top story without thinking about how we were going to illustrate it. 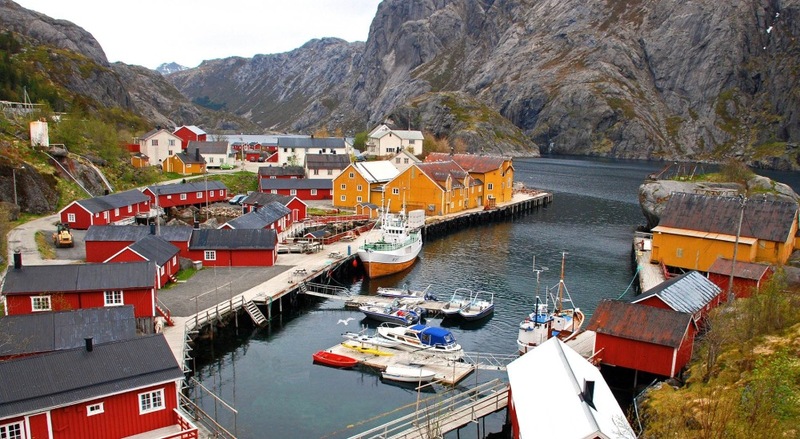 So up there is just a picture of the real-life town of Nusfjord. Paul: This isn’t our finest hour, is it? Quinns: Quick, let’s distract them with the box! I love the fretful pastoralism of that last sentence. Isn’t part of the thrill of Rosenberg’s Agricola that it could all go horribly wrong if you miscalculate your carrots? 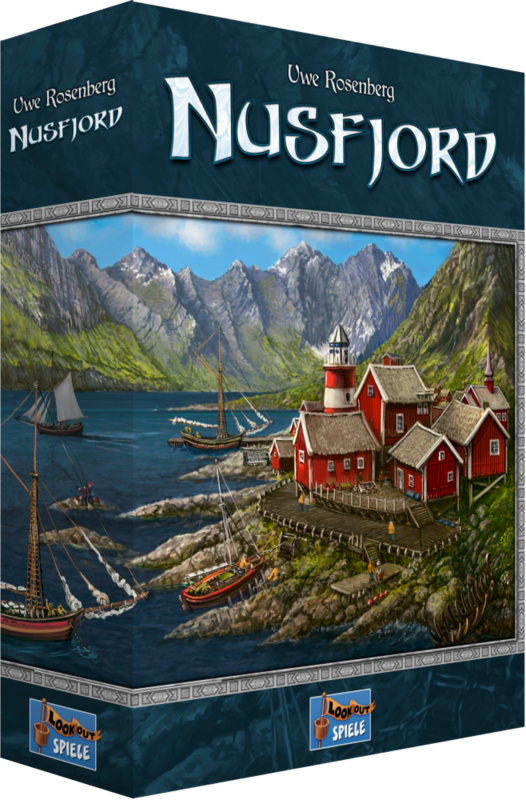 We’ll probably post about Nusfjord in the news again when we can see inside the box. I, for one, am hoping for a lot of cardboard fish. 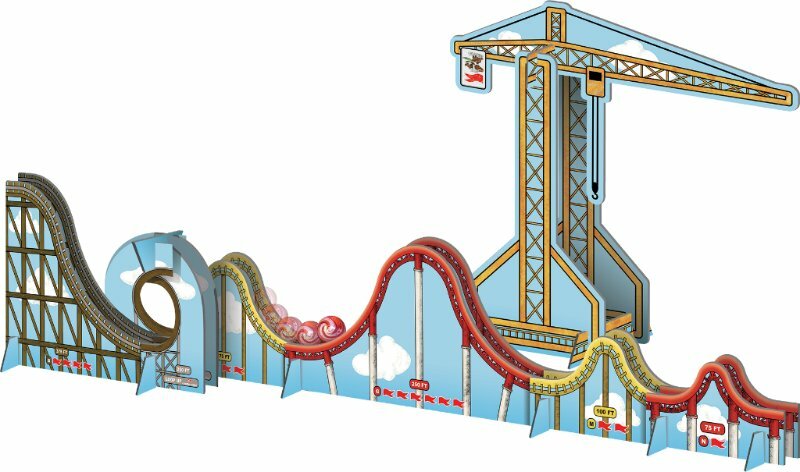 Paul: One fizzy story that was sadly lost amongst the monstrous melee of GenCon news was the announcement of Coaster Park, which looks like a gloriously fun idea for a game. It’s one part assembling a team who will help you make the greatest rollercoaster of them all, one part actually making that rollercoaster, a real thing that you will assemble in front of you and then roll marbles along to check the physics of. Quinns: Let me tell you what I love about this. Whenever I see pics of it I think to myself “There is no way that I will at all struggle with this challenge, which is clearly incredibly easy.” I know from experience that this means (a) I am going to be terrible at it and (b) my friends are going to cry laughing at my overambitious tracks. Also, I’m a bit perturbed at how the cars just… fall of the track at the end. Talk about the ride of your life. Paul: You know what? 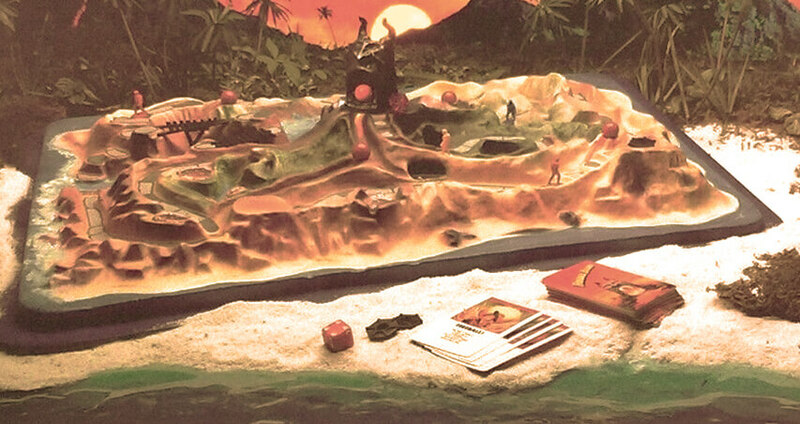 With this news, as well as the announcement that a new version of Fireball Island is coming from Restoration Games (original game seen above), I suddenly have a massive, overwhelming desire to feature marbles in all board games, ever. PLEASE, GAMES DESIGNERS, make ONLY marble-based games from here on. Quinns: Practice what you preach, buddy. I expect the official SU&SD review of Marbles on my desk by Monday. Quinns: Paul, this is marble madness. …Actually, we could do a retro week in 2018? You review Marbles, I review Twister, Matt reviews… uh, dominoes? 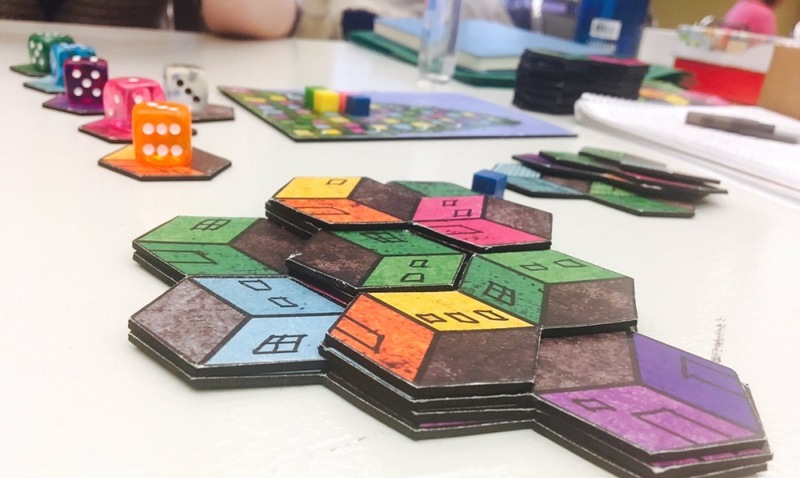 This is a tile-laying game of neighbourhood building and beautification, where you try and build best-looking favelas according to changeable, fickle criteria. Will this best NMBR 9 as Quinns’ colourful stacking game of choice? Are the two games even comparable? Has Chris even been to Rio? Is Quinns going to do a NMBR 9 review? More on this story as it develops. 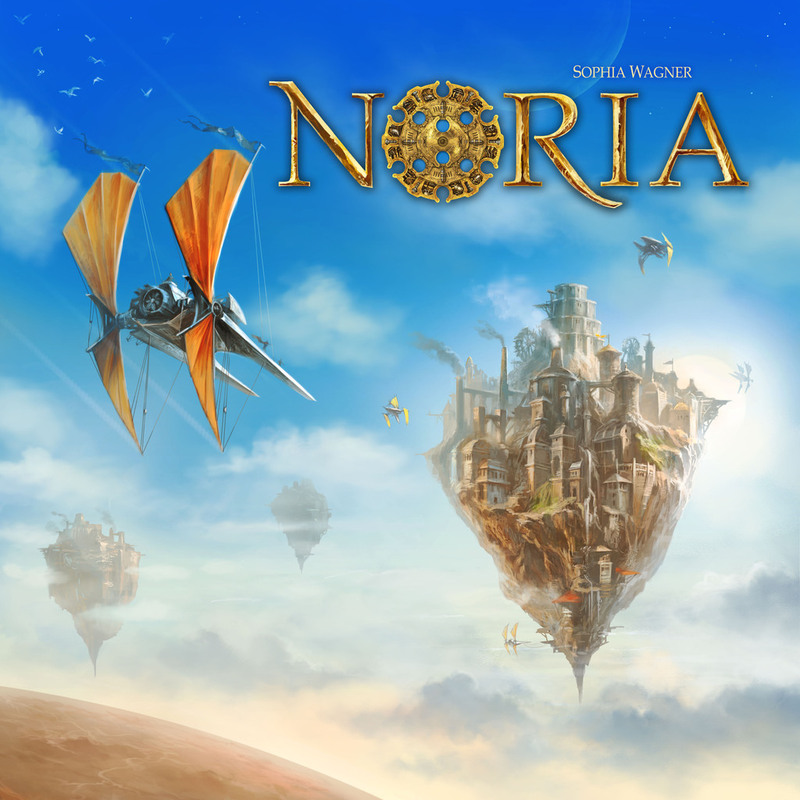 Also intriguing me this week is Noria, a game of flying islands, airships and what looks like some very fancy art. It’s the debut game from designer and author Sophia Wagner, who won the Spiel des Jahres fellowship two years ago (something I admit I hadn’t heard about that before now). Central to the game are the curious-sounding action wheels, which you constantly add new discs to and then configure to select the actions you perform. Quinns: “Discover flying islands, buy ships, and build factories. Invest in prestigious projects, and secure their success by passing on secret knowledge to politicians”? Sounds good to me. I wonder if they couldn’t have called it something a bit more zesty, though, or at least given it a subtitle. SKY BASTARDS: THEY’VE GOT ACTION WHEELS. That’s what I would have called it. 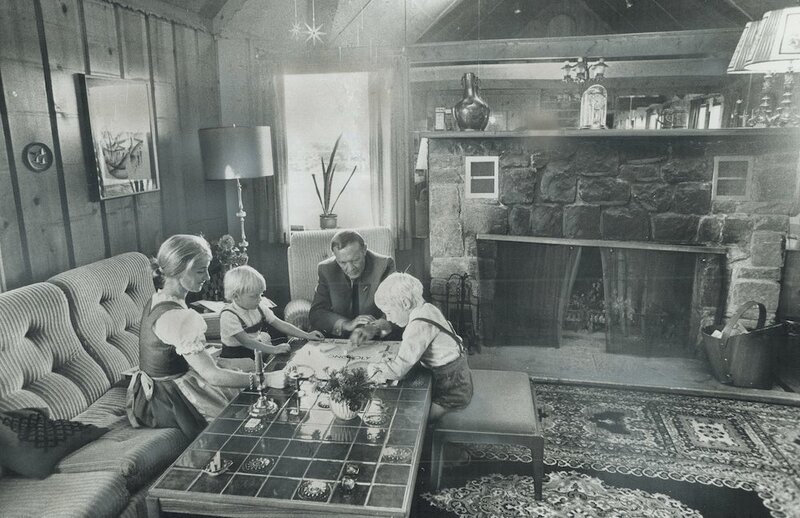 Paul: How did your application to be a Spiel des Jahres fellow go, Quinns? Finally, we’ve got a Kickstarter for you lot! Well, some of you, anyway. 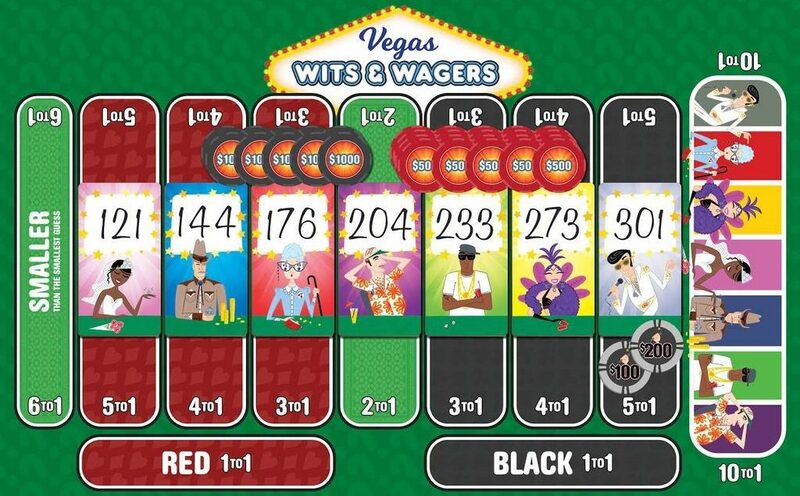 Vegas Wits & Wagers is an outsized, extra-extravagant edition of that zenith of trivia games, Wits & Wagers. Designed for up to 21 players, the Vegas edition offers an enormous, double-sided playmat, as well as additional options for betting on your friends and an extra-large deck of questions, all with the aim of turning the original game into an experience that can truly fill a room. I absolutely love this idea. In fact, I wanted to make it today’s top story! Then I noticed that the Kickstarter only ships to the USA and Canada. Imagine my disappointment! Especially when I wanted to do a Wits & Wagers review next year. Wits & Wagers? Splits & Wagers, more like. 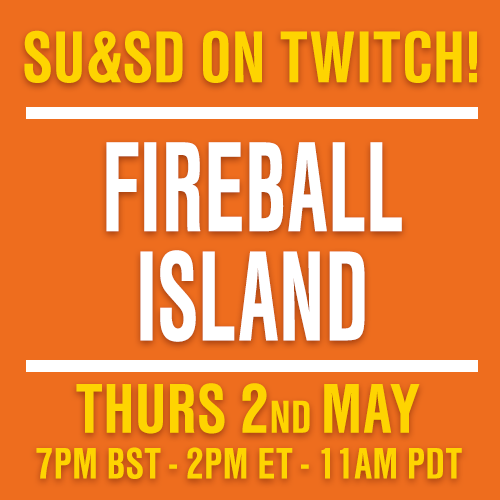 Paul: ANYWAY a quick Google shows that the logistics of shipping such a big game was overwhelming proposition to the publishers, plus a lot of the questions are America-centric, so they didn’t anticipate much demand. Which is fair. It’s a shame that there’s no “Europe” version in development, but still fair. Before we wrap up I’d also like to give a quick nod to the irreverent No Time for Games, which was an all-too-late arrival to this week. Their videos are a mix of dry-humoured, self-deprecating reviews and peculiar re-subtitlings of foreign films to make them all about board games. So naturally I think they’re terrific. They even mention us at one point. Dryly. Dismissively. Which is, I think, how I like it. 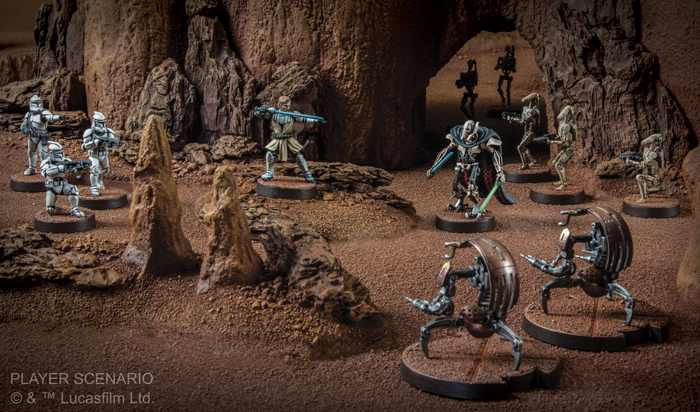 Also, while we didn’t make it to Gen Con this year, here’s No Pun Included with their own special Gen Con video. Good to see it’s not only us who can’t find enough fruit in Indianapolis. Quinns: True story: I got so excited by the depictions of Meeple Circus in that NPI video that I went and read the game’s manual. Is it insane that a dumb game of balancing wooden circus acts is my most anticipated game of 2017? Paul: Not in the slightest.